Mardi Gras is the celebration of the end of carnival season. This festive event, which occurs immediately before the Catholic season of lent, has been a state holiday in Louisiana since the 19th century. Filled with food, parties and parades it’s a popular time of year for locals and visitors alike. 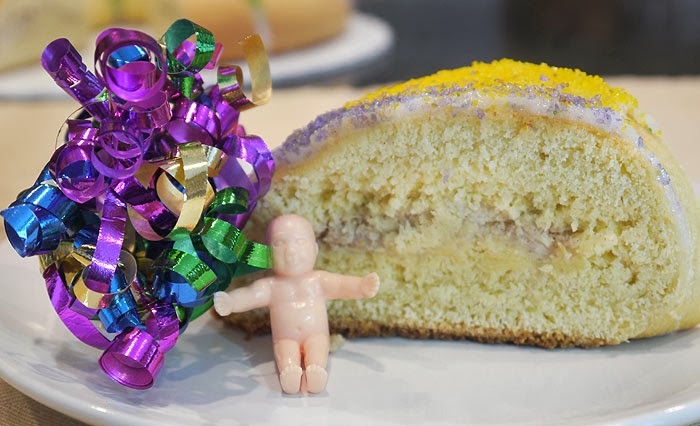 Even if you’ve never been to Louisiana you can easily introduce the spirit of Mardi Gras into your home with the King Cake. 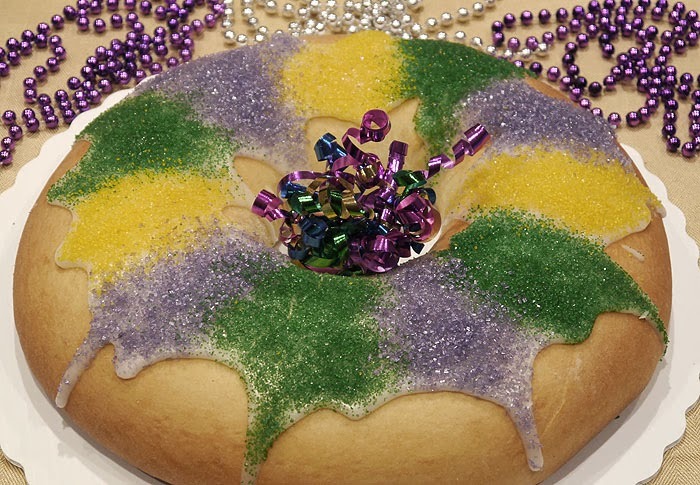 Traditionally the King Cake was a ring of twisted cinnamon dough topped with icing which is colored purple, green and gold representing justice, faith and power. Today the cakes are baked in various shapes and often include a wide assortment of fillings. It's customary to bake a small trinket, usually a plastic baby, into every cake. The person that receives the slice containing the trinket must buy the next King Cake and throw the next party. Having made some pretty cool friends on a recent visit to Baton Rouge I was able to get a cream cheese filled recipe for King Cake from the Louisiana Culinary Institute. I added some cinnamon to make it my own and the result was fabulous. Although the recipe may seem daunting this was a very easy dough to work with and it all came together without any issues. In a large bowl, dissolve yeast and pinch of the sugar in warm milk. let stand until creamy, about 10 minutes. Stir the egg yolks into the milk mixture. In the bowl of an electric mixer, combine the flour, salt and remaining sugar. With a dough hook mix the milk/egg mixture 1 cup at a time into the flour, then slowly add the butter into the dough in tablespoon size chunks. When the dough has pulled together, turn it out onto a lightly floured surface and knead until smooth, about 8 minutes. Lightly oil a large bowl, place the dough in the bowl and turn to coat with oil. Cover with a damp cloth and let rise in a warm place until doubled in volume, about 2 hours. In a small bowl, combine the cream cheese, egg, lemon zest, cinnamon and 1/2 cup confectioners' sugar. Mix well. in another small bowl, combine the remaining 2 cups confectioners' sugar, lemon juice and 2 tablespoons milk. Mix well and set aside. Turn the dough out onto a floured surface. Roll the dough out into a 6x30 inch rectangle. Spread the cream cheese filling across the center of the dough. Bring the two long edges together and seal completely. Using your hands shape the dough into a long cylinder and place on a greased baking sheet, seam-side down. Shape the dough into a ring. Cover the ring with a towel and place in a warm place to rise until doubled in size, about 45 minutes. Bake in preheated 350F oven until golden brown, about 30 minutes. Allow the bread to cool. Press the baby into the ring from the bottom so that it is completely hidden by the dough. Drizzle cooled cake with lemon/sugar glaze and decorate with sugar sprinkles. This King Cake is such a beauty!! I feel more festive just looking at it. Love how festively you decked out your cake! I need to make this! We love king cake and it would be so fun to celebrate Mardi Gras with this! My husband lived in New Orleans for a few years so I know he would be thrilled -- and I've been dying to try my hand at this cake for years. Thanks for the inspiration! I've eaten plenty of king cake, but never made one. Your recipe looks straightforward, so I'm going to give it a go! Thanks! It's beautiful! And actually sounds fairly easy to make! no food coloring at all...it is colored sprinkles!